If you're interested in increasing your home's value, installing new windows is an excellent place to start. Replacing windows in your home can be a quick and easy upgrade to your home's value. Modernize is the expert on finding the most reliable contractor if you're needing replacement windows in Fresno, CA. Our reliable contractors can help you fix any problems you're having with your home's windows. You can enjoy a more energy efficient home by upgrading, repairing, or restoring your windows today! We want to help you find the best contractor for your home. We are proud of what we do. We want to connect our homeowners to the best local window contractors in a quick and easy process. Get free quotes from the best window replacement contractors in Fresno, CA, ready to complete your project. Save up to $2200! Save up to $2200! We are a local solar company that sells and installs solar… More	We are a local solar company that sells and installs solar panels to help you reduce your electricity bill. If you own a home or apartment in Fresno and you are planning on installing new windows, there are a few things you should know before you make your purchase. Not only are there a large number of operational styles and design options to choose from, you should also consider how your location in Fresno can influence the type of window you purchase for your home. In Fresno, there are building codes and permit requirements unique to the city. Additionally, Fresno is located in central California which is in both the south-central and north-central regions designated by ENERGY STAR®. It is important to consider how windows will perform in these regions before making a purchase. Energy efficient windows are important for keeping your home comfortable without skyrocketing utility bills. Continue reading to learn more about the basics of window buying, window payment options in Fresno, window installation requirements in Fresno, and how the climate in Fresno should affect the windows you choose to purchase. Before you take a look at the factors specific to Fresno which should influence your purchasing decisions, it is helpful to understand the basic characteristics of windows and the different choices available to you. The first decision you will need to make is whether you will be buying replacement windows or new construction windows. Replacement windows work best for a simple replacement because they are designed to fit into the opening left behind after the removal of an old window without the need for construction on the surrounding wall. In comparison, a new construction window is designed to be nailed directly to the studs, which means they will only work in building and remodel situations where the studs will be exposed. The next decision to be made is based on how the windows will operate within your home. One of the most popular windows for residential buildings is the double-hung window. This window is constructed with two vertically hung operational sashes, with one sliding upwards and the other downwards to open. If you have a single sash window in mind, casement, hopper, and awning windows all open outwards from one hinge. Additionally, there are larger, more architecturally interesting windows such as bay and bow windows, which have a group of three or more windows placed together at a curve extending into the outdoor environment. The last decision you will need to make is about the basic design elements of your windows. Both replacement and new construction windows are available in wood, vinyl, aluminum, and fiberglass and you can choose from numerous finish options. You will also be able to select from a wide range of window hardware and glass grid designs. In Fresno, homeowners are required to obtain a permit anytime they will be making major improvements to their home. This means, if you plan to replace your window you will need to obtain a building permit from the Public Works and Planning Department of the County of Fresno. Next, you will need to a hire a contractor for the work. In order to protect yourself from the consequences if one of the contractor’s employees were injured while working in your home, it is important you hire a contractor who carries workers’ compensation insurance. In addition to this, Fresno requires contractors to obtain a general builder’s license from their county office before performing any work on residential or commercial buildings within the city. In Fresno, there are not window replacement financial assistance programs in place. Unfortunately, just like the rest of the United States, tax credits for energy efficient home improvements stopped being offered at the end of 2014. Because of this, homeowners in Fresno will have to choose from more conventional methods for paying for home improvements including credit cards, a home equity line of credit, or saving up cash to pay for new windows. 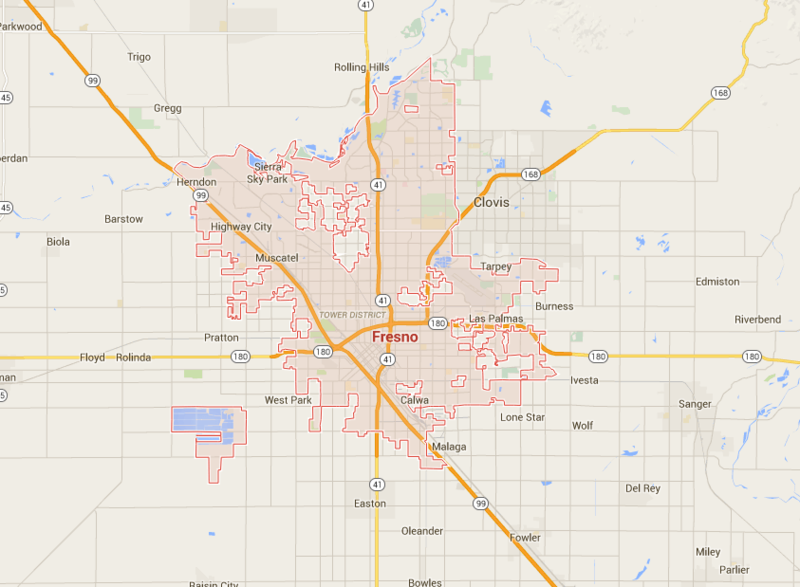 According to ENERGY STAR®, Fresno is located in both the north-central and south-central zones. These zones are characterized by requiring heating during certain parts of the year and cooling during others. Fresno is located further away from the coast compared to many of the major cities in California; because of this, temperatures are a little more extreme, rising as high as 96.6 degree during the summer and as low as 37 degrees during the winter months. Climate should be taken into consideration when buying windows for your Fresno home. The best way to select an energy efficient is window is by reading the National Fenestration Rating Council, or NFRC, labels placed on the windows. The U-Factor, the Solar Heat Gain Coefficient, the Visible Transmittance, and the Air Leakage ratings are all located on this label. A U-Factor rating represents the amount of heat that passes in or out of a window. When the number is higher, this mean the window is letting more heat leave or enter the home. This means the heating and cooling system will need to work hard to keep your home comfortable during seasons characterized by extreme temperatures. Because of this, it is always better to choose a low U-Factor rating and in Fresno the recommendation is buying a window with a U-Factor of no more than 0.30. The solar radiation passing through a window is measured by the Solar Heat Gain Coefficient rating. A high SHGC can work to the advantage of the homeowner if they live in cold climates, but in a warm climate like Fresno’s, a high solar heat gain coefficient will only overheat the home. In Fresno, ENERGY STAR® recommends a rating of no more than 0.25. In Fresno, you are not required to choose a window based on it’s Visible Transmittance ratings, this means you can choose a window based on the view you prefer for your home. The Air Leakage rating represents the amount of air passing through a window. In Fresno, it is best to select a window with an Air Leakage rating of no more than 0.30. Of course, it is always beneficial to choose the most energy efficient windows available in your area. Buying windows that comply with ENERGY STAR® requirements could save homeowners in Fresno as much as $126 each on utility costs alone.